Well, every other section has something similar, so - let's post pics of our instruments! At the moment, I play a Squier Strat, neck pickup, tone controls set to 4. The pedal is a boss ME-20, the amp is very very old, made by Intermusic (anyone heard of them?). In the future, I'd like a 1x12" combo, with a 1x12" extension cab, preferably Marshall for both. So, what do you guys play? Edit: I use a 3.00 mm pick, because using a thin one means you never learn things exactly right. Here is my DIY Oversized 2x12 cabinet. 3/4" fur, all dado construction, polyeurathane glue, closed bottom, open top, finished in box-liner spray. Testing with a little Altec Lansing subwoofer for a speaker. The holes are recessed for Celestions. And here is my Gibson BFG Les Paul. I facking love this guitar, love at first site, feels tight, love the "chisel marks", nice sound, loud even unplugged and because it's a barely finished guitar it appeals to the ADD carpenter in me! Sorry heres the Les Paul. I guess you have to click on it, not sure why. It's really small too, I just copied it from my facebook page, guess I didn't need to resize it any more. Oh well, beats using PhotoBucket. Last edited by TechnoBeaver; 9th April 2010 at 04:19 AM. What's with all the guitars? Doesn't anyone play anything else any more? And a Stanley Clarke-ish 5 string I'm building (will take ages to complete). I've also built a Ashbory bass in the shape of a Rickenbacker bass, assembled a Precision bass, and am building another bass (6string headless fretless semiacoustic). Oh yeah, and some stompboxes, fuzzes, big muffs, an Ampeg Scrambler, busy doing a Seek Wah workalike, a Phase 100, a tremolo. Lots of stuff! TechnoBeaver - that's a nice looking cab, and I really wish I had an amp like that one. How does the little sub sound? The photo of the guitar isn't showing too well - perhaps you have a better one? Still, from what I can make out, it looks pretty good. Bob - perhaps you'd like to show us some of those instruments - I know I'd be interested to see some, as I expect you'll have some I've never heard of. Jarno - you have some very nice basses there, and I'm particularly jealous of those speakers. Like the amp - clean and simple. I'm sure there's more of us on here with an instrument - come on, guys - get 'em posted. I would recommend everybody to build their own cabinets, there's really not that math involved, especially for guitar cabinets. Also, the amount of woodworking skills needed is pretty low. Carpeting is also pretty easy. From a financial standpoint, low driver counts are more interesting, because commercial firms get discounts on drivers we do not. A commercial 1x12 cabinet is much more expensive than a home made one. But if you want to make an 8x10 the difference between commercial and DIY is much smaller. The cable in the second picture is nice as well, I used to work at a firm designing MRI scanners, and I got a piece of that cable from the bin and soldered neutrik jacks to it, it's a pretty expensive silver conductor RF cable. It sounds great, but unfortunately, it's stiff as a board, minimum bend radius is something like 30 centimeters. Last edited by Jarno; 11th April 2010 at 10:05 AM. Here is me with my silly electronic piano and a home made amplifier for it. More pics to follow. My singer, Gigi is there too, prettier than I am for sure. 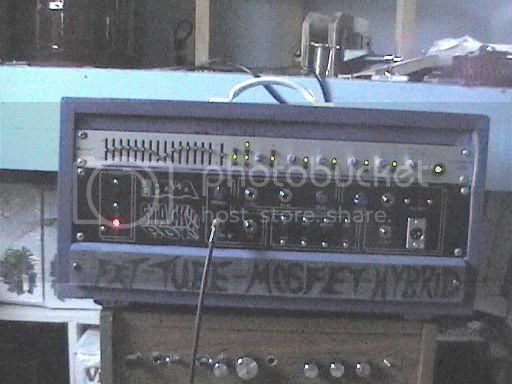 Bob - that amplifier looks nice and professional. Is it a single wide range driver, or do I see a compression driver in there somewhere?